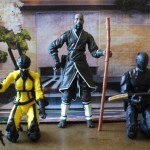 HissTank forum member jinx723 is back with another G.I.Joe Retaliation Wave 4 figure review, this time of Blind Master! Blind Master made an appearance in the original Marvel Comic continuity as Billy, Cobra Commander‘s son, found his way to the Blind Masters dojo. This is where we learn that Jinx was the Blind Master’s protege. 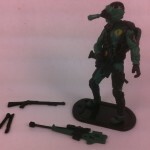 He was also mentioned by Jinx during her sparring session with Beachhead in the G.I.Joe animated movie. In G.I.Joe Retaliation and per the figure’s dossier, Blind Master is the wise and mysterious leader of the Arashikage ninja clan who can see what others can’t. He is the toughest of masters and has trained Snake Eyes, Storm Shadow and Kim ‘Jinx’ Arashikage in the secret ninja arts. He is skilled with multiple weapons including the bladed shield, the flying saw and legendary nine-ring sword.